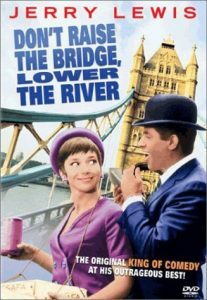 Don’t Raise the Bridge, Lower the River is a Jerry Lewis film, based on the book of the same name. Oddly, Jerry Lewis is cast playing the part of the straight man in the movie — George Lester, an American who goes from one get-rich-quick scheme to another, much to the distress of his suffering wife Pamela, played by the lovely Jacqueline Pearce. After three years of being dragged across the globe, she has had enough of his constant neglect of her and sues for divorce. While she leaves the country as part of dealing with her emotions, George decides to ‘renovate’ her ancestral home, a stately English manor, and turn it into a 1960’s style discotheque and Chinese restaurant. When Pamela eventually returns home, she is aghast. And George thought to regain her affections by proving that he can make money by staying in England. At this point, the movie becomes somewhat disjointed, as George tries to earn 25,000 English pounds to repay Pamela for the cost of the renovations with the aid of Willy Homer, a con artist played by Terry-Thomas, who convinces Jerry Lewis’ character to sneak into the office of Pamela’s new boyfriend, take photographs of a new oil drill that his company’s developing (which is one of the genuinely funny scenes in the movie), and sell them to unnamed Arabians. This involves things like George catching the mumps, smuggling the photos on a tooth by another character who’s going to Lisbon, blackmailing his friendly dentist, several scenes where George tries to show off his rival as a no-good jerk, and a ‘zany’ ending, where everything seemingly gets resolved — except that Pamela is still estranged from George. At the very end, back at the house, there is a romantic reconciliation — as well as Terry-Thomas’ character trying to involve Jerry Lewis’ character in another scheme. I have to say, that this is the least funny Jerry Lewis movie that I’ve seen thus far. It had some funny moments, but the pace was very slow, and it seemed that Jerry Lewis’ talents weren’t utilized here. It’s not a terrible movie, but I wouldn’t have watched it if it hadn’t been for reviewing it for this site, either. I only rate it 2 clowns out of 5.